Since its recognition by the African Union in 2016, the Africa Day for School Feeding marks a moment each year to recognise the immense value of home grown school feeding in improving retention and the performance of children in school. From the ministry came Joy Mamili (left), Veno Kauari (2nd from left) and Otto Imbura (centre right). 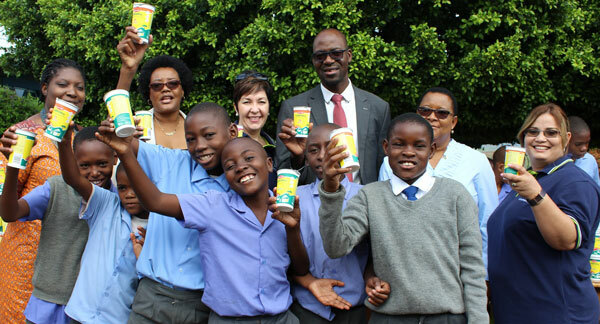 The Oshikandela was brought to the school by Leonie Prinsloo (centre left) and Diedre-Ann Rhodes (right) from the marketing department at Namibia Dairies. On 1 March 2017, the principal of Hillside Primary School, Nathalië Uaendere hosted officials from the Ministry of Education, Arts and Culture to commemorate the Africa Day of School Feeding. To mark the occasion, partner company Namibia Dairies and Pick n Pay gave every learner in her school a carton of Oshikandela cultured milk to commemorate the Africa Day of School Feeding. Hon Katrina Hanse-Himarwa, Minister of Education, Arts and Culture. Hon Hanse-Himarwa reiterated that 330,000 learners in Namibia receive a mid-morning nutritious fortified maize meal each school day in over 1400 schools across all 14 regions in the country. Learn more about this event in Namibia (Namibia Economist). Learn more about the regional event held in Congo.